Artvarium is the modest project room in the Museum, which is neither totally inside nor simply outside of the exhibition space. It is detached from the main exhibition area with three steps, but it’s reattached to it through its glass wall which is visible from the both of the floors. Therefore, the exhibitions that take place at this project room on one hand have their own expression independent from the collection but on the other hand they construct a dialog with it. The upcoming Artvarium exhibition by Mürüvvet Türkyılmaz is entitled “Overjoyed Ones”. 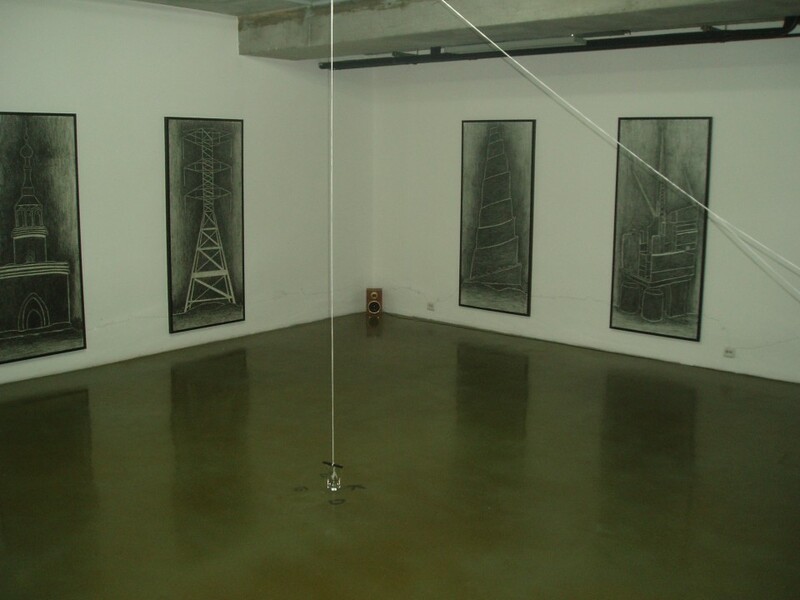 The installation consists of six drawings of towers varying from Babylon Tower to petrol towers, which are specifically produced for this project room among with a light and sound installation. While drawing on the horizon between the pictures, she highlights the ordinary and legendary ascending images of our lives. Since her earliest periods, consistency and “unanimity of thought” have been the easily observed facts in Turkyilmaz’s works. The chosen images, objects and techniques run round in circle and come back in a fresh context. In the same way, her artworks proudly exhibit the obvious long term thinking and production process through an invisible frame: the conceptual structure comes together with hand crafted eye-straining work to create a visual feast. It’s not a coincidence that this installation of Türkyılmaz is being exhibited in a gallery that takes place at the entrance level of a high raised building. While stating and asking that “the groundbreaking ceremonies of the sky scrappers are arranged in deep cliffs created by class disparity. Let us see whether our souls would reach the sky?” Türkyılmaz on one hand questions the role of these architectural structures in our physical and political life, and on the other, looks for her own place among their unavoidable presence.